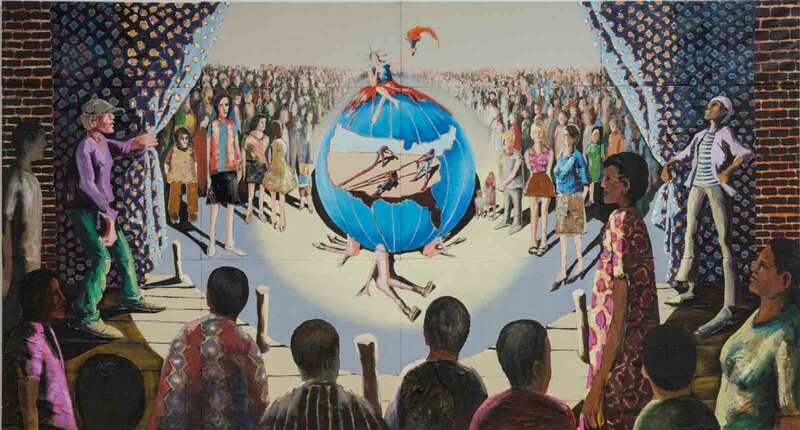 At the center of this work, a young blonde woman in an American flag dress holds a torch as she sits atop a globe, where three black men are depicted laboriously pulling an unseen object across the United States. The woman is Lady Liberty, but she does not bring freedom to all citizens. This painting, a study for a larger work titled Trash, is part of “The Bicentennial Series” (1970–76), in which Benny Andrews accurately predicted the exclusion of African-American history and culture from the 1976 U.S. bicentennial celebrations.